With the Steelers on a bye week, there was no need for one of our “football game lunches” so we decided that we would go out for a late breakfast in the North Hills. Not being a native to Pittsburgh, I’m not sure I would have ever known that Valliant’s Diner existed. It is a cute little diner on Babcock Blvd with a classic diner charm. It isn’t very big inside, but it sure has a lot of character. In traditional breakfast fashion, we each ordered an omelette – TasteBud A got the tomato and cheese, I got the everything omelette. We also got a side order of homefries. The coffee was a little lackluster, but I prefer my coffee strong. 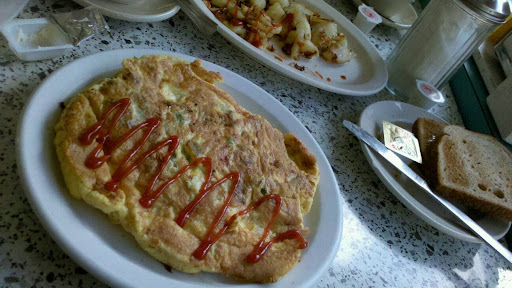 The homefries were good as were both of our omelettes. At one point during the meal I noted that I wish there was some meat in my omelette, considering they call it “everything”. 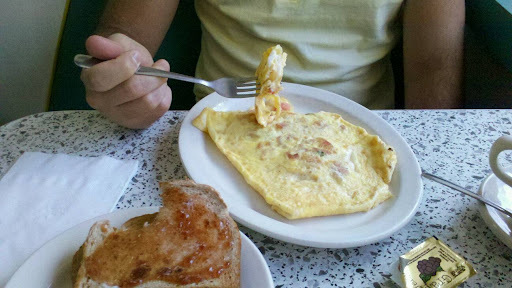 One complaint I had was the use of American cheese in the omelette and the amount of it. It was a little runny in spots. It wouldn’t have been my first option for cheese, but it did the trick. In most instances, I would pay extra if I could have an alternate option. After ordering, Tastebud A noticed a specials menu that the waitress never mentioned. The Montana Omelette. I wish I would have noticed it beforehand. Maybe it was the atmosphere, the inexpensive price or the company, but I left satisfied ready to do some shopping. Oh, and it’s cash only, so bring some Washingtons!